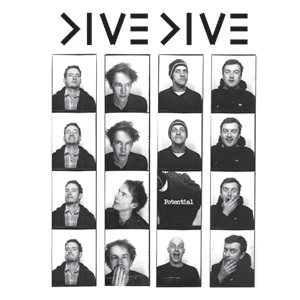 Not many bands could do what Dive Dive have achieved, playing as Frank Turners band to mass crowds on a relentless and never ending tour, across more countries than most people could name off the top of their heads and still finding time to release their third studio album ‘Potential’. Dragging lead singer Jamie Stewart back into the studio they have managed to dust off that folk residue and self produce a record that sounds like they never even went away. There’s no messing around when it comes to getting this album up and on its feet, ‘Mr 10%’ is fast paced and when your singing along to the second chorus you realise this band certainly haven’t lost that knack for great song writing. ‘The Alarm’ drives things along with a rougher sound before ‘Damage Control’ and its effortless melody greet you like an old friend. There’s no doubting why ‘Liar’ was chosen as the first single, its punchy and quick delivery brims with confidence and a great sing-a-long. ‘The You In Me’ slows things down before jumping in with some big riffs surrounded by light pop tinges. ‘Wherewithal’ is a short and pleasing affair, then ‘Ape Like Me’ steps in to slow the tempo and strip things back, with great vocals from Jamie Stewart. His louty delivery throughout giving this album all the right punk sensibilities with next track ‘Collapse From The Hurt’, which then shine in ‘The Point Is’. With the resenting lyrics of "Nothing ever changes round here" and before you know it your thrown into ‘Your Call Is Important’, and the frustration of call centre work. ‘Pod People’ and ‘Lets Swap Places’ brim just like this rest of the album with frustration and witty observational lyrics, with more hooks than Robson Greens tackle box. Hidden track ‘Potential’ plays the album out with its straightforward and brilliant vocal. This is quite simply a great album, and the fact that they wrote and recorded it in the time they could find away from Frank Turners tours and rehearsals is quite frankly ridiculous, not for one second does this sound like an album that has just been hastily thrown together. 2010 was an amazing year for British rock, and 2011 just had a fine start with this gem from an incredibly underrated band. ‘Potential’ by Dive Dive is due for release on 17th January on Xtra Mile Recordings. Dive Dive on Myspace, Facebook and Twitter.